The Pomona Vet Surgery provides friendly, effective medical care for animals with an accent on prevention of disease through regular pet checkups, vaccinations and health monitoring. Established in 1982, the Pomona Vet Surgery is well-equipped for dentistry, surgery and intensive animal care and is a council approved premises for overnight hospitalisation. The practice specialises in animal acupuncture and chiropractic treatments. Quality pet care and nutritional products are also available. 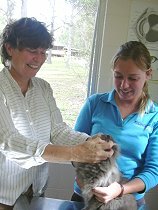 Carol commenced her profession in a mixed practice at Ian Macdonald's Veterinary Surgery, Cooroy from December 1978- May1982. From May - August 1982, she worked in her own practice at Eumundi, awaiting completion of the Pomona Vet Surgery building. Since August 1982, she has conducted her private practice at Pomona, specialising in small animal medicine, surgery, dentistry, on site radiology and cases requiring hospitalisation. In 2004 she introduced acupuncture and chiropractry. 6 weeks as a volunteer in the control of the foot and mouth disease outbreak in the United Kingdom, Sept-Nov 2001. AVA - Australian Veterinary Association. Gardening - at present Carol is trying to re-establish the middle layer of the natural bush on the nature strip outside her house. This business is currently closed and the premises available for lease.